Hazel and Emily are on their third visit to the club. 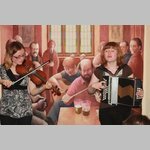 Fiddle, melodeon and voices are what you get from this young duo whose star is very much on the up, and when they visit, it will be in the middle of a major tour. These sure-footed performers cram a lot into their lives, Hazel as part of Lady Maisery and Emily playing early instruments for theatre productions. They are also very involved in Dartington International Summer School each year. Look out for their new CD.